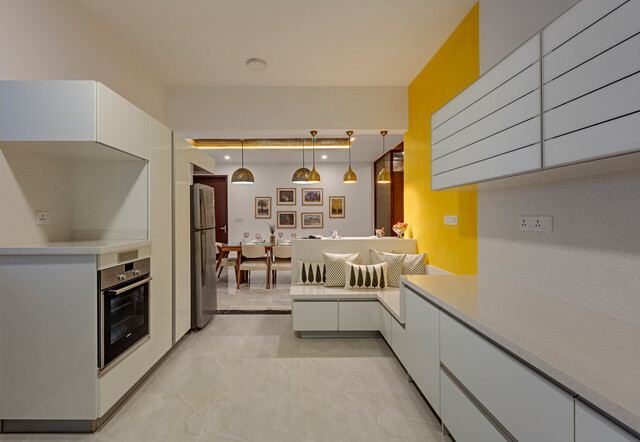 The U-shaped kitchen is done up with a shade of white, which is broken aesthetically by a yellow wall adjoining a low seating area that has been incorporated into the kitchen. With open kitchens now being the preferred option to closed kitchen and the space being used increasingly for socializing with family and friends, the seating arrangement is intimate, with its throw cushions, yet does not come in the way of work being done in the kitchen. The work triangle of the kitchen has been created such to ensure enough of working space and to prevent any cross contamination of sorts. The refrigerator has a dedicated alcove that also provides easy access from the dining room as well. Nothing like taking that dessert treat straight from the fridge to the table. The backrest of the kitchen seat forms the beginning of a breakfast counter with seating placed in the dining room. This countertop has been designed specifically to turn down and form a seating bay for the elderly members of the family.